At our hospitals we have digital CR Radiology. This allows for quick turn around on x-rays versus older chemically processed radiographs. We are able to take an x-ray and have an image within minutes. The images are also crisp and clear, allowing for good diagnostic quality. 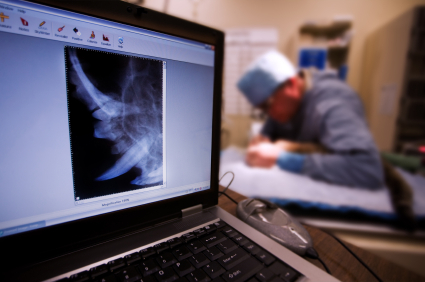 In addition to allowing quick and quality images, it eliminates the need for harmful chemicals to process x-rays. This allows a safer environment for your pets, our clients, our staff and the world as a whole! Ultrasound is offered as a great way to help visualize areas of the body that we cannot see or even feel on examination. There is a rapidly growing use in veterinary medicine given it is safe, noninvasive, non-painful and provides a great level of information. Allows ultra-sonographer to check the size, shape, structure and function of the internal organs. Can be used to look at the following: Liver, gall bladder, kidneys, adrenal glands, intestines, stomach, pancreas, urinary bladder, prostate (males), uterus and ovaries and even internal lymph nodes. Any organ with air, such as the lungs, limit what can be seen.